Filled with interesting facts you probably didn’t know about tea, these tea facts are a wonderful collection of tips, historical facts, and tea trivia. 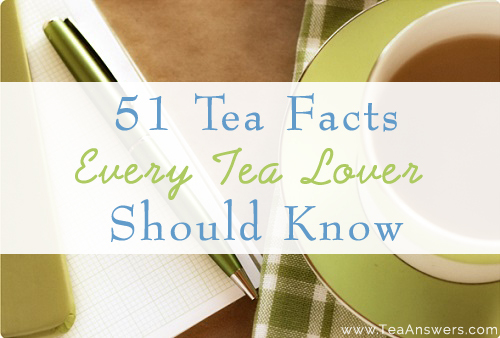 Enjoy this collection of tea facts over a warm, comforting cup of tea. 1. You may have heard that iced tea was invented at the 1904 St. Louis World’s Fair by an Englishman named Richard Blechynden, where it was so hot, tea wasn’t selling. Richard had the idea of pouring it over ice and it was an instant success. However, Richard wasn’t the first person to create iced tea. A recipe for iced tea can actually be found in Housekeeping in Old Virginia by Marion Cabell Tyree, published in 1877. 2. Tea bags were invented in 1908 in the United States by Thomas Sullivan. He created small silk bags to give samples of tea to his customers. Some of them thought that the bags were supposed to be put directly in the tea pot, like a metal infuser, rather than emptied out. Thus, the tea bag was created by accident! 3. There are four major tea types – black, green, white and oolong – but they all come from one plant, Camellia sinensis. It’s how the leaves are treated that the different types of tea are created. 4. When making a pot of tea pour hot water into the teapot to warm it before you make your tea. 5. The art of reading tea leaves is called tasseography. 6. Legend has it that tea was discovered by Chinese Emperor Shen Nung in 2737 BCE. A tea leaf accidentally fell into his bowl of hot water, and the rest is history. 7. Rooibos is an herbal tea made from a plant that grows in South Africa. It’s leaves look like needles and are fermented like regular tea leaves. 8. Tea absorbs moisture, so it’s important to store loose tea or tea bags in a sealed container. 9. Traditionally, milk was poured into a cup before the tea to protect the delicate china. That’s no longer necessary. 10. The leaves from raspberry plants can be brewed to make a fruity, herbal tea. 11. Sherpa tea is a special blend of tea that can be brewed at high altitudes, where water boils at a lower temperature. It’s a blend of oolong and Darjeeling teas. 12. Chrysanthemum tea is a favorite herbal tea in Korea and China. It’s often drank when ill as it’s thought to reduce fevers and ease headaches. 13. For centuries, tea was used only as a medicine. It took almost 3,000 years for it to become an everyday drink. 14. Chai is a sweet, spicy black tea from India made with milk, honey, vanilla, and spices like ginger, cloves and cardamom. 15. Ginger tea is a delicious, warming tea that is thought to help with colds and morning sickness. It can be made with fresh or ground ginger. 16. Tea first arrived in Canada in 1716. It was imported by the Hudson Bay Company. It took over a year for it to arrive. 17. A formal tea service includes a teapot, sugar bowl, milk pitcher, coffeepot, hot water pot, slop bowl, teacup and saucer, and tray. 18. The slop bowl in a formal tea service holds the discarded hot water that was used to warm the teapot. 20. Tea arrived in Russia in the 1600s when the Chinese embassy in Moscow gave Czar Alexis a gift of tea. 21. Black teas are made from leaves that are fermented and then heated to remove moisture. The heat turns the leaves black. 22. Bubble tea began in Taiwain in the 1980s. It was originally made with black tea, tapioca pearls, condensed milk, and honey. 23. Earl Grey tea was named after a nineteenth century British diplomat to China. 24. Herbal teas are not actually teas because they do not contain leaves from the plant, Camellia sinensis. Instead, they are infusions made from the roots, leaves, flowers, seeds, and/or fruits of various plants. 25. Tea strainers or infuser baskets allow tea leaves room to expand, producing a better quality tea. 26. Green tea leaves are not fermented. They are steamed and then heated to remove moisture. 27. Tea used to be very expensive. It was kept in a locked tea chest in the parlor. The lady of the house was responsible for the tea and was often the only person with the key for the lock. 28. In Italy, tea is made from the leaves of Manzanillion and Mission olive trees. This tea is appropriately called Olive Leaf Tea. 29. Loose tea remains good for about two years, provided you keep it away from light and moisture. 30. Tea bags are good for about six months before they start to lose their flavor and quality. 31. Afternoon tea began in the 1800s by Anna, the seventh Duchess of Bedford. She invited guests for tea and sweets to fill the long period between breakfast and dinner. 32. You should always use fresh water when making tea. Water that has been boiled previously has lost oxygen which can make your tea taste flat. 33. Traditional English Tea is served between 3-6pm. The later it is served, the more substantial the food that is offered. 34. In the late 1800s, green tea was the most popular tea in the United States. During World War II, green tea sources were unavailable. Americans began importing tea from India, which produced black tea. After the war, black tea was the most popular tea. 35. Earl Grey tea is flavored with bergamot oil. Bergamot is a citrus fruit grown in southern Italy. The oil used in Earl Grey tea comes from the fruit’s rind. The fruit is also used to make marmalades and liqueurs. 36. Orange Pekoe tea has nothing to do with oranges. It got its name from the Dutch House of Orange and has to do with a term used to grade black teas. 37. In Tibet, butter tea is a common drink. It is made from black tea, yak butter, and salt. 38. In Egypt, a common tea is Karkade. It is made from hibiscus flowers and contains a lot of sugar. 39. Moroccan Mint tea is a favorite tea made in the Middle East. You can make it by adding spearmint leaves to black tea. 40. Genmaicha is a Japanese tea made from green tea and roasted brown rice. Rice was added to tea to make it stretch further during tough times. 41. The formal tea known as afternoon tea is also called Low Tea. It was created to allow a light snack before dinner, and served in sitting rooms at the low tables near the chairs and sofa. 42. High Tea was created during the Victorian era when an evening meal was ate with tea. The foods were eaten at a high dining table. 43. In Ancient China, tea was a form of currency. Tea leaves were pressed into a brick. One side was scored so that it could easily be broken if change was needed. 44. Black tea can reduce eye puffiness. Steep two black tea bags in hot water for five minutes. Remove the bags and squeeze out the liquid. Allow the bags to cool, and place them on your eyes for 10 minutes. 45. Tea was introduced to England in 1662 when Charles II married Portugal’s Catherine of Braganze. Her dowry included chests of tea and the regions of Bombay and Tangier. 46. The best green tea is from the first harvest (late April-early May). 47. Oolong teas can be brewed up to three times. 48. Matcha is a powdered green tea used in Japanese tea ceremonies. 49. Lemon and milk shouldn’t be used in the same cup of tea because the lemon will curdle the milk. 50. English tea gardens were the first public gathering place where women were allowed to mix with men publicly, without scandal or criticism. 51. Pu-erh tea is supposed to be slurped. Slurping aerates the tea, increasing the flavors and allowing greater contact with your taste buds.